Black Rhodium Coral HDMI review | What Hi-Fi? 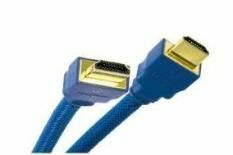 This no-frills cable is a functional blue, and its satisfyingly chunky plug locates far more positively in an HDMI socket than that of some rival designs. It also meets all the technical specifications laid down by Silicon Image, co-developers of the HDMI standard. Many rivals claim the same, but it's still reassuring that Black Rhodium makes this one of its major selling points. Pictures are highly detailed, with convincing colours and impressive stability, but compared to a similar length of Ixos XHT458, the Coral isn't quite so rich, either in colour or black depth. Not an unreserved cable recommendation, then, but well worth an audition.